A lot of businesses struggle with proper waste management. There are strict rules and regulations that the Australian government laid out which businesses must follow. As such, it is essential for companies to have an efficient waste management system. On the other hand, homeowners too can produce a significant amount of waste. Rubbish generated from spring cleaning, landscaping or renovation may be too much for a regular bin to handle. Handling large amounts of rubbish can be costly and time-consuming. Thankfully, skip bin services are around to make managing residential, commercial and industrial waste easy and affordable. In this article, we will discuss some of the good reasons why you should use a skip bin service. If you want to discover a cost-effective and convenient way to manage your waste, read through this article. It is hazardous to have waste and rubbish lying around your work area. You might think that having one item misplaced would not seem dangerous, but workers can easily overlook it, trip, fall and suffer injuries. Having a tidy work site keeps your labourers safe from accidents. Aside from that, it also helps you make a good impression when clients visit. 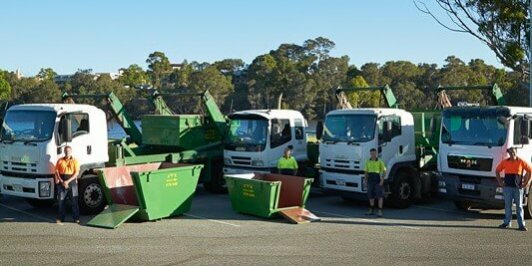 Hiring a skip bin service to get rid of your commercial waste allows you to manage your rubbish properly, keeping your workplace safer and healthier for the workers. Occasionally, your house may generate large volumes of waste. One of the simplest and quickest ways to deal with this amount of rubbish is to get help from a reliable skip bin hire company. Select the appropriate bin size and they will deliver it to your property. There are no complicated processes to get rid of your waste when you hire a skip bin. The great thing about skip bin hire companies is that you can find good ones on the Internet. Discovering their number online allows you to book a bin without leaving the comfort of your house. Here at A’n’K Budget Bins, we also accept green waste, so do not hesitate to give us a call when you’re planning a major landscaping project. Aside from offering a simple way to get rid of waste, hiring a skip bin service is also cost-effective for significant amounts of rubbish. When you rely on your regular waste pick up services, it would take several weeks before you can get rid of your entire rubbish load. If you want to remove them all at once, you would have to pay a certain fee and yet wait for their scheduled pick up. On the other hand, when you choose a skip bin service, you can choose your own delivery and pick up dates. You can get rid of your entire rubbish load at once and at your selected date. Business owners typically have a lot of things to worry about and managing their waste is not one of their priorities. There are certain rules and regulations for commercial waste and the process can get technical and extensive. Our advice is to leave this complicated process to professionals. At A’n’K Budget Bins, we always keep abreast the local council regulations for disposing of commercial waste. You can rest easy that your commercial rubbish will be taken care of accordingly. Using skip bin services brings many benefits not only for homes, but also for workplaces. While reducing your carbon footprint, you are also keeping your workplace tidy. Professional waste management companies like A’n’K Budget Bins allows you to manage your waste responsibly. Hiring a skip bin prevents the local landfills, as well as illegal waste dumps, from filling up. Recycling in the workplace encourages people to become friendlier to the environment. Before hiring a skip bin, it would be best if you ask questions and conduct some research about your chosen provider. Find out how they dispose of their rubbish. A’n’K Budget Bins partners with a licensed sorting facility. We take your rubbish to this facility to have it sorted and salvaged for recycling, re-use or redistribution. One of the options you can choose when getting rid of waste is making trips to the local rubbish tip. While you can save money on this option, it can consume so much of your time and money. If you do not have the right vehicle, you might need to make several trips to the tip. If you want to take your entire rubbish load at once, you have to hire a flatbed truck. With skip bins, you do not have to drive your vehicle to the local rubbish dump. You can book a skip bin service and the bin will be delivered to your location. You can place it on the driveway and start filling it. The skip bin company will come back after a few days to pick up the bin. Hiring skip bins is also ideal for rubbish you regularly generate, including gardening waste like leaves and grass clippings. Some residential rubbish is generated once in a while. However, falling branches and leaves occur in the garden regularly. You can accumulate a great deal of green waste which may take up a bigger space. In this case, it would be best if you hire a skip bin. A’n’K Budget Bins also accepts green waste like grass clippings, twigs, branches, leaves and palm fronds. Managing residential, commercial or industrial waste is a tedious and complicated task to undertake. So, it is best to leave the job to expert rubbish removal companies. Doing so ensures that the task will be completed extremely well. Even for residential waste, you will find that a skip bin hire service takes care of every essential aspect of your waste management. Whether you are undertaking a renovation, spring cleaning or landscaping project, a skip bin hire service would be beneficial to you. So, if you need to get rid of huge volumes of rubbish, do not hesitate to call A’n’K Budget Bins today. We will be glad to help you determine the ideal skip bin size for your particular amount of waste.